as summer draws to a close and the autumn approaches i'd like to share with you a thought that i had scrawled on a piece of paper...not sure where it came from... "As we come in from the garden at summer's end, we must harvest and purify our intentions. We must continue to grow inwardly...shed our old ways, like the ritual of autumn. By relinquishing them, we give way to new and much more productive thinking." "I am exited to get the next newsletter. Crafting, painting and sewing help me keep my sanity and having a strong believe in God helps me through a lot. If the projects I worked on could talk, they would have a lot to say about some of the difficulties I've experienced in life. Making a wonderful new project really does help. I just wished I had more friends to get together with here in my new hometown. It is always hard to meet new people, especially some that you have a lot in common with and seem to click right away. Right now I'm making a baby quilt for my sister's baby in Germany. They love quilts over there and really appreciate them. I'm also still busy with my friendship quilting group. Can't wait to check my mail for new blocks. It has been a lot of fun.
" Mummy:I make a simple wire body form, minus head but with a neck, and staple it to a wooden base. Wrap with 1" wide strips of thick quilt batting until you get a "person" shape. Then I make the head with a bag shape of black fabric, stuff firmly and gather at the bottom. Just attach this to the body at the neck, with hot glue. I cut strips of gauze in a random rough manor. Start wrapping the figure in a hap hazzard way. You do not want him to be neatly wrapped, but completely covered. The more treads and ravels the better. The only space that stays uncovered is a bit in the middle of the face. This should be just enough room to paint two eyes peeking out. Paint two white ovals and dot with black pupils. The gauze can be tea dyed before hand, but I usually spray him with tea after assembly to give it a more uneven look. I use the fake spider web from the craft store and run a few webs from his body to the base. Some tiny spiders look great too. I only make a couple of these every year for a boo-tique. I still have one that is 6 years old. Think he will need a new spider web this year." 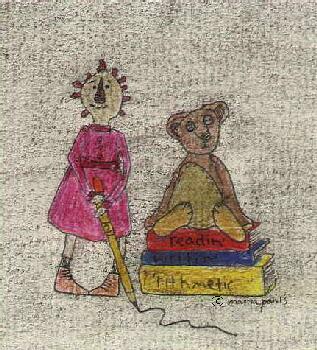 "The Crow And The Weasel"
the story of chistina's family of stuffed animals and bears told by big bear. nice photos. the history and prose related to teddy bears with some good photos. "Count the night by stars, not shadows, count your life by smiles, not tears. And with joy on every birthday, count your age by friends not years."